This post discusses the camera settings and equipment recommended for photography from a helicopter or airplane. 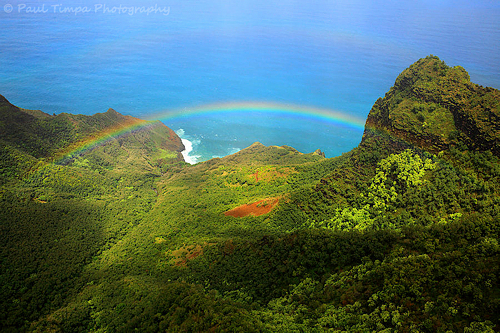 It is a follow-up to my previous post that displayed images from an aerial photo shoot on Kauai's Na Pali Coast in Hawaii. 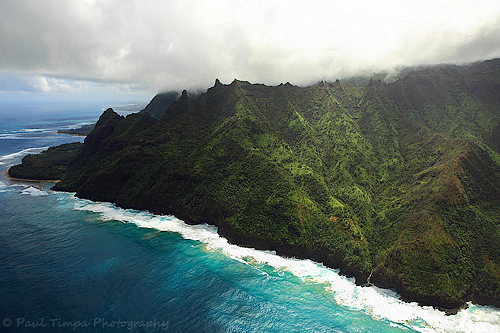 I recently returned from Hawaii where I knew I would be taking a helicopter tour of Kauai. Prior to the trip, I did much research into the appropriate camera settings and equipment for aerial photography. I was very happy with the results of my trip and thought I'd share what I learned from my research and from the actual photoshoot. Assuming you'll have your D-SLR with you, the main choice you'll have to make is which lens to bring for the helicopter tour. Keep in mind that in most cases, you will not be allowed to change lenses during the flight. As a matter of fact, you will likely not even be able to bring additional lenses. It's important to make the right choice. I recommend a zoom lens in the moderate-wide-angle to short telephoto range, such as a 24-70mm on a full-frame camera, or an 18-55mm or 17-85mm lens on an APS-C camera. This will enable the widest range of shots that capture the magic of aerial photography. Telephoto zoom lenses have too long a focal length to capture the spectacular wide sweeping views you can achieve from the air. I do not recommend bringing your 70-200mm lens. On the other end of the spectrum, ultra-wide angle lenses like a 16-35mm on full-frame or 10-22mm on APS-C have too limited a focal range, and equally as important, are almost too wide -- at the widest focal ranges you may actually get much of the helicopter itself in the shot, even on a doorless helicopter where you're able to shoot from outside (you'll still capture the rotor blades and the landing skids). Your best bet is a lens that covers approximately 24mm to 100mm full-frame-equivalent. As far as accessories, don't bring any. Filters like polarizers will only get in the way and decrease your shutter speed. There is also limited time to constantly be adjusting the filter. The same applies to lens hoods, which will limit mobility, and in a doorless helicopter will get torn off by the wind. Leave all filters and lens hoods on the ground. Use the largest memory card you have, preferably 8GB at minimum. Many helicopter tour operators do not allow mid-flight changes of your memory card, especially in a doorless helicopter. There are a few things I recommend when it comes to camera settings. Firstly, shutter speed is the most important setting to monitor. You'll need very fast shutter speeds in order to combat the movement and vibrations of the aircraft. I suggest ensuring that the shutter speed is at least 1/1000th second at bare minimum, and preferably in the 1/2000th range. You can achieve these speeds with a combination of wide aperture and ISO. 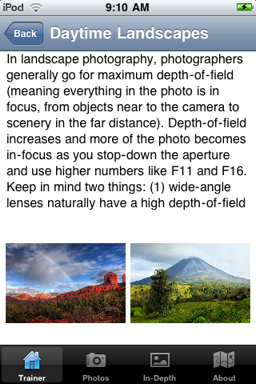 While there are many ways to set the camera, my suggestion is using Aperture Priority mode. Set the aperture to one of the widest settings to allow plenty of light into the camera. Depth-of-field is not an issue since most everything will be focused at infinity. Depending on the brightness of the day, start with the ISO at 100 or 200 and check the shutter speeds that are achieved with that aperture / ISO combination. If you're in the range of at least 1/1000 to 1/2000, you're OK. If the shutter speed is below that, raise the ISO until you're in that range. During the flight, you'll need to constantly monitor the shutter speed through the viewfinder, as lighting conditions can change dramatically depending on the scene. Be prepared to raise and lower the ISO quickly to compensate for changing conditions. I do not recommend just setting the ISO to 400 or 800 because if you encounter a very bright scene, you may reach your camera's max shutter speed and wind up with an overexposed photo. In addition to being able to adjust the ISO quickly, you will likely need to adjust exposure compensation frequently to achieve the correct exposure. Be prepared to adjust exposure compensation from scene to scene by quickly checking the LCD to confirm you're not over or underexposed. For this same reason, I suggest shooting in RAW so you have the most flexibility with exposure adjustments when you get home. While I would normally suggest Manual focus at infinity for the shoot, to ensure the speediest shooting, I'm instead going to recommend auto-focus. The reason is that there is a lot of movement inside the helicopter, and it's possible you might accidentally move the focus ring out of focus and wind up with an entire batch of out-of-focus images. During the day, your camera will have no problem keeping up with focus. As for shooting mode, you can decide between single-shot and continuous shooting. If you're going to use continuous shooting, you'll need an extremely large memory card, of at least 16GB. As previously mentioned, in most helicopters you will not be able to change memory cards mid-flight. Continuous shooting can be helpful to ensure keepers, and also to give you a better chance of capturing a shot without the rotors visible. Even at very fast shutter speeds, with wide-angle lenses, it's possible to catch the rotors in the shot. If you're going with continuous mode, just be sure to use it sparingly and in short bursts. You don't want to run out of memory card space half-way through the flight. Aerial shots from a helicopter or airplane can produce some truly spectacular images. I hope these tips and suggestions will help you on your photoshoot. 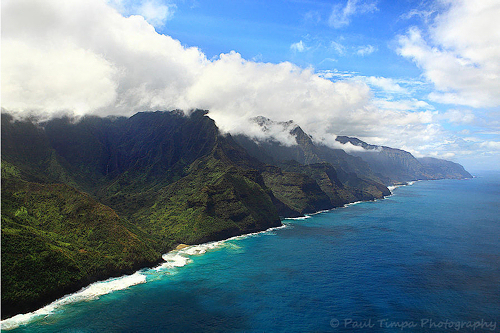 I recently had the opportunity to photograph Hawaii's Na Pali Coast on the North Coast of Kauai from the air. It was a spectacular experience. I highly recommend it, especially for photographers. 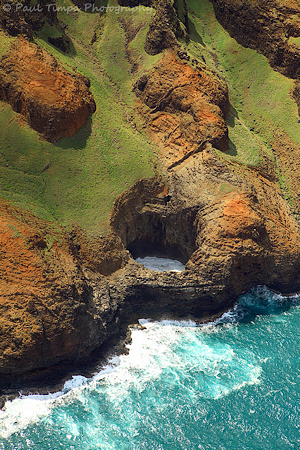 You can capture amazing images during an aerial shoot of Hawaii from a helicopter. The image above shows the rugged coast with a secluded beach. We chartered a helicopter from Jack Harter Helicopters, one of the most respected companies in Hawaii. They were fantastic. Most importantly, apart from their expertise, is that they offer charters in helicopters with no doors. Their tours are available in Hughes 500 helicopters flown with the doors off. This is essential for capturing quality images because you don't have to shoot through glass. It also allows you to capture a variety of angles that would otherwise be impossible. 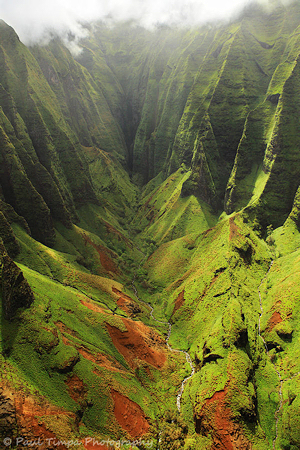 The photo above is of a deep valley within the Na Pali Coast. You can really see how rugged the landscape is here. 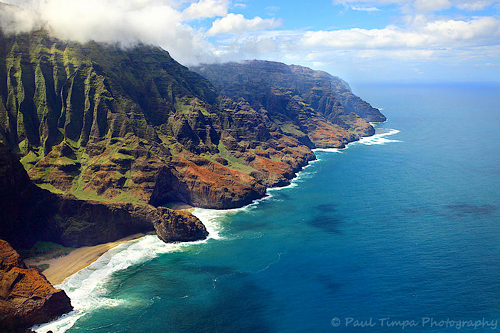 The photo below of the Na Pali Coast also shows the famous Kalalau Hiking Trail (though it may be difficult to see in a lower res image). This challenging but incredibly picturesque hike winds its way along the Na Pali Coast. Further to the left in the frame, you can see Ke'e Beach. The image below is of a stunning valley with several waterfalls. I counted at least five waterfalls in this image. Truly amazing. "How to photograph from a moving helicopter": If you're photographing with a D-SLR, I recommend the following camera settings to get the most number of keepers. Provided it's bright enough, set the ISO to 100 or 200. Shoot in Aperture Priority mode with one of your widest apertures. Be sure to have your finger on the exposure compensation dial because you may need to adjust frequently if the meter reading is off. Most importantly, keep your eye on the shutter speed the entire time. I'd suggest ensuring that it is always at least 1/1000th of a second at minimum. If it drops below that, raise the ISO as necessary. You'll want to continually monitor the shutter speed and the exposure, because if you raise the ISO for a darker scene and then return to a bright area, you may find that you reach the maximum shutter speed resulting in overexposed images. Lower the ISO again if this happens. It's a constant balancing act between shutter speed and ISO, but it's a fun experience and the results are worth the challenge. The photo below is taken with the camera pointed straight down (something that is somewhat impossible in a helicopter that has doors). This is a sea cave on the coast. Below you can see a sweeping wide-angle view of the coast, and how beautiful it is. 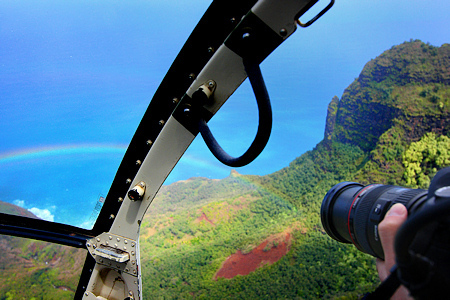 For anyone visiting Hawaii, a helicopter tour will provide memories to last a lifetime.